Press coverage What about forest fires? At a few times in our nation's history, a species of tree was so magnificent that the President of the United States proclaimed a national monument to honor and protect that tree in a significant portion of its range. The Joshua tree in the Mojave Desert, the tree-like saguaro and organ pipe cacti in the Sonoran Desert, the bald cypress in Florida, the giant sequoia in the Sierra Nevada and the coast redwood in northwestern California and southwestern Oregon all have namesake national monuments or national parks. Each of these tree species is magnificent in its own ways, and so is the Douglas-fir. 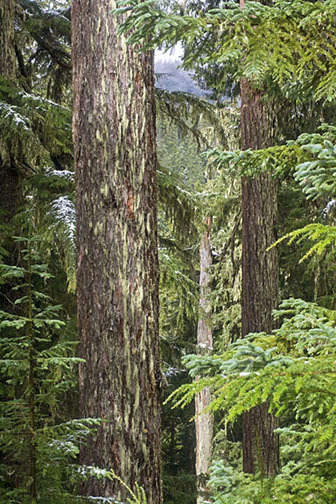 After a century of logging there is very little ancient forest left in the Pacific Northwest, and old-growth remains only in scattered, isolated stands. But much of the federal timberland that was cut decades ago and then replanted has the potential to become healthy forest again. A national monument that is managed for ecological restoration could bring this about, as well as preserving the best old forest that still remains. 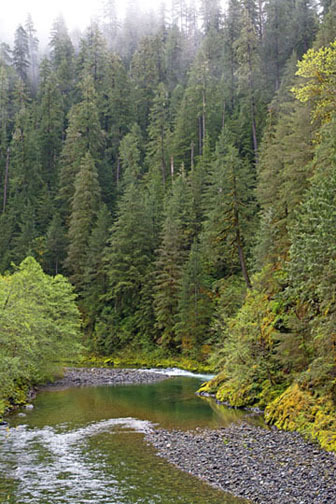 Why are Pacific Northwests forests important for climate change? Go to the Climate Change and Forests page. 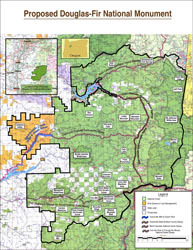 We propose to establish the monument in the Santiam River watershed of the Western Cascades of Oregon, from the Opal Creek Wilderness south to the divide between the Santiam and McKenzie drainages, and from just above Green Peter Reservoir to the Cascade Crest. It would cover over 750 square miles, mostly parts of Willamette National Forest but including some BLM land to the west that has some exceptional old-growth near Crabtree Lake. The proposal specifically excludes the towns of Detroit and Idanha, as well as Detroit Reservoir. It includes the Middle Santiam, Menagerie and parts of the Mt. Jefferson Wilderness areas, as well as the Quartzville Creek Wild and Scenic River corridor, and also Moose Creek which has a salmon run. Not all of the area in the proposed Monument is forest; there are meadows and mountains as well. 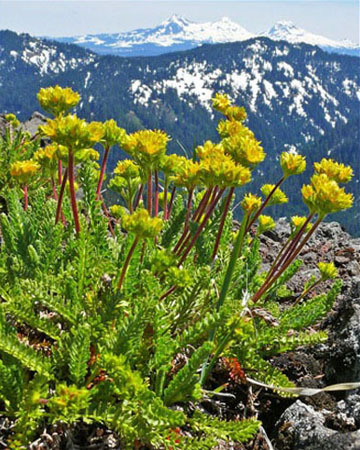 This is a rare flower, Ivesia gordonii, growing on Cone Peak.